Step in the Arena Worlds first Match against real players. Test your strategy and skill against real opponents or connect with friends in live Match action on hundreds of levels with unique settings gorgeous effects and unexpected turns. 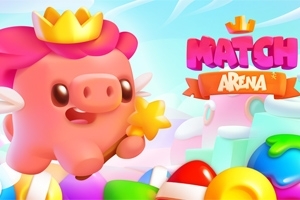 Play and climb to the Golden League of Match Arena by completing exciting challenges on your way up Let the cutest piggymagic accompany you in your exciting and challenging journey.